As I became more involved in campaigning I realised how difficult it can be to ensure information is accessible to all. Some disabilities were relatively easy to provide accessible information for, by asking people to make transcripts of audio for people with hearing impairment or ensure written information is compatible with speech-reading software used by those with a visual impairment. But it felt unconscionable to be campaigning for all people with disabilities without providing information that could be understood by people with learning disabilities as well. In September 2011, I challenged the Labour leader, Ed Miliband, at the party conference on why his party wasn't speaking on behalf of disabled people. He apologised and pledged to do more. I wanted every disabled person to know about this promise so that they could hold him to it, but I knew that my blog or Twitter account wouldn't reach many people with learning disabilities, of which there are an estimated 1.5 million. So, I got in touch with the disability charity United Response, which advocates better access to democracy, to write up an "easy read" report on what had taken place – one which used visual cues and simplified language to get across the important information. To my delight, hundreds of people read it and passed it on. Twitter was buzzing with it. We worked together again on the first report by disability campaigners Spartacus, which challenged the government's plans to abolish disability living allowance. United Response translated the Responsible Reform report into an easy-read version, helping it to have a bigger impact across traditional and online media. United Response media team and I agreed it was a shame that there wasn't a more regular source of easy-read news. It was a lightbulb moment. That's when the idea of Easy News was born, the first-ever newspaper aimed specifically at people with learning disabilities. A publication that would keep them informed on key events and political stories in a way that would make sense to them. The Big Lottery funded a year-long pilot. I stayed in touch, offered encouragement and was thrilled to watch the idea take shape. UR Consultants – an expert team of people with learning disabilities employed by United Response – translated the news stories into an easy-read format. Research by the charity among 300 people with learning disabilities found that just 16% were interested in politics, largely because of the inaccessible way it is presented. 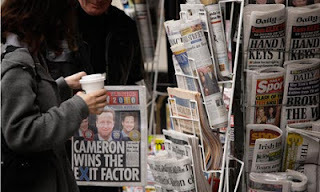 Only one in 10 read newspapers, but an encouraging 58% said they would read an easy-read one. Of all the campaigning I have done over the past few years, Easy News is the project I am most proud and excited to be involved in. Full participation in society means being able to understand and inform ourselves about the world around us – only then can we choose who to vote for and be part of the democratic process as full citizens. It is also really important that politicians understand people with learning disabilities have the right to vote, because often political decisions are based on how certain groups of voters will react to them. Easy News is a vital part of this process and another step along the road to full rights and participation for all disabled people.